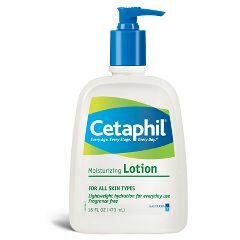 Cetaphil® is a is non-comedogenic moisturizing lotion for all over body hydration. The non-greasy formulation is mild, non-irritating and long lasting. This gentle moisturizing formula contains emollients and humectants that bind moisture to the skin. This fragrance-free moisturizer contains no lanolins or parabens. Apply daily to dry skin as needed or as directed by a physician. Daily use of a moisturizer will help maintain your skin's integrity by enabling the skin to better retain moisture. This regimen should include the skin of the whole body, not just the face to help restore skins natural protective barrier. Keep some by all sinks. Wallow in pleasant lotion. Daily Use. I use this on my wheelchair bound husband's skin, which has a strong tendency to be dry and flaky. His caregivers tell me that their other clients also prefer it. Is there a better pump for this product. The pump stops working when the container is about three quarters used up?